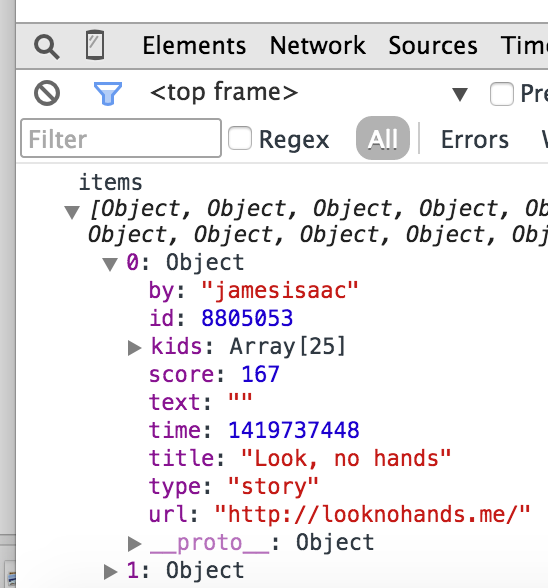 This is a visual React tutorial. This tutorial should give you a feel for "growing" a React UI from small, modular parts. By the end of this tutorial, you will have built the HN front page in React. Note: This tutorial covers React, Browserify, and CSS. It does not cover event handling (not needed for the HN front page), state (not needed for the HN front page), or Flux. Create the project directory structure. Note: We will be building the project from scratch. The solution in this repo is meant primarily to be a reference. Download the sample data into /json. Download y18.gif and grayarrow2x.gif into /img. Install Browserify, React, and tools. Add the rank and vote. Create a new JS file: /js/NewsItem.js. Note: You should be able to paste this code directly into your JS file. Create a new JS file: /js/NewsItemTest.js. Note: This lets us develop the NewsItem component in isolation, rather than requiring it to be hooked into the full app. Create a new CSS file: /css/NewsItem.css. We are following Jacob Thornton's CSS style guide. Create a new CSS file: /css/app.css. Create a new HTML file: /html/NewsItem.html. Visit http://localhost:8888/html/NewsItem.html. You should see the following. Note: This code should be added onto the existing code in /js/NewsItem.js. Note: This code should be added onto the existing code in /css/NewsItem.css. Refresh the browser. You should see the following. Update the JS. Note: We are factoring out the title part into its own method. You have now implemented an HN news item in React. Display the logo and title. Create a new JS file: /js/NewsHeader.js. Create a new JS file: /js/NewsHeaderTest.js. Create a new CSS file: /css/NewsHeader.css. Create a new HTML file: /html/NewsHeader.html. Start the HTTP server if necessary. Visit http://localhost:8888/html/NewsHeader.html. You should see the following. You have now implemented the HN header in React. Display the header and items. Create a new JS file: /js/NewsList.js. Create a new JS file: /js/NewsListTest.js. Create a new CSS file: /css/NewsList.css. Create a new HTML file: /html/NewsList.html. Visit http://localhost:8888/html/NewsList.html. You should see the following. You have now implemented the HN item list in React. Create a new JS file: /js/app.js. Create a new HTML file: /html/app.html. 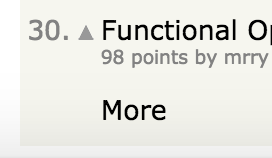 You have now implemented the HN front page in React. morpheus: Isomorphic blog/publishing platform built with React. Permalinks, themes, RSS support. Sends JSON payload to client for bootstrapping.